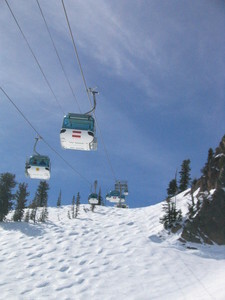 Snowbasin, Utah, USA, is a scenic resort comprised of multiple peaks with 9 lifts (including 1 cable car, 2 gondolas, 2 high speed quads) rated #30 of all North American resorts. Snowbasin is perfect for intermediate skiers & snowboarders, but offers challenging terrain for experts. Snowbasin Snowsports has adopted Terrain Based teaching techniques to accelerate students' progress. 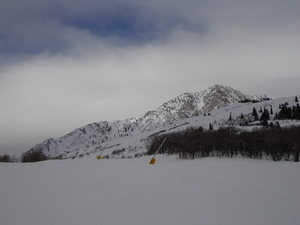 Snowbasin has 4 terrain parks including kids cross & family cross areas. Snowbasin maintains snowmaking on 38 trails and combines that with grooming rated #12 in North America. Snowbasin compliments its award winning mountain operations with picturesque lodges, hosting restaurants/bars rated #3 in North America for their fare. Enjoy dining atop the peaks at Needles Lodge or John Paul Lodge while absorbing panoramic views. Apres ski in the Cinnabar at the massive Earl's Lodge with entertainment on weekends. Local accommodations 15 minutes. Salt Lake Airport is 33 miles away. Salt Lake City to Ogden commuter rail depot is 17 miles. Please join Snowbasin as we welcome the Holidays with our annual Christmas Eve celebration. Evening dinner offered along with caroling, tree lighting, Santa's arrival, torchlight parade & fireworks. Snowbasin is an unbelievable mountain. It's huge, has great lifts & gondola service, and amazing dining on the mountain thanks to the Salt Lake Olympics a few years back. One caution is that windy days can tend to shut down Strawberry Lift which accesses some incredible, huge, open bowl skiing. The view off the back of Strawberry Lift is absolutlely amazing - something every skier should see at least once. The only downside is that there is no lodging on the montain. A good B&B in nearby Huntsville (try the Atomic Chalet, ask for Wes) is the best way to go. Otherwise, you have to drive in from Ogden.